Dr. Energy Saver is Ohio's professional air sealing company in state. Our company helps homeowners live more comfortably in their home's, while reducing home energy consumption. Through our companies free whole house energy audit we can locate all of your home's energy wasting air leaks. Once we locate all the air leaks we can prioritize all the most important leaks that will help improve your home's interior living and energy savings. Air sealing is a no-maintenance, permanent upgrade - there's no replacement or changes to be made. Contact us today to set up a free air sealing estimate appointment. We will locate those hard to find gaps and holes and air seal them for good! We proudly service Ohio neighborhoods. 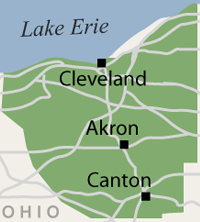 Our service area includes: Cleveland, Akron, Canton, Lorain, Elyria, Massillon, Medina, Strongsville, Lakewood, Chagrin Falls, Hudson, Cuyahoga Falls, Ravenna, Bedford, North Royalton, Westlake, North Olmsted, Wooster, Painesville, Alliance, Kent, North Canton, Beachwood, Barberton, Willoughby, Gates Mills, Stow, Brunswick. Households without proper air sealing can greatly diminish a home's energy efficiency and comfort. Imagine trying to warm your home on a winter's day with your living room window wide open? You wouldn't do that. However, some air leaks within a home may be as significant or almost as significant as leaving a window open. The worst part is the average homeowner has no idea! Dr. Energy Saver can identify air leaks throughout your home utilizing professional equipment, such as our blower door test and our whole house energy assessment. After we locate air leaks in your home we will show and explain to you which leaks should be sealed to improve your home living. Call us today or visit us online for a Free Estimate on our insulation services or our free home energy audit. Our contractors have the expertise and professionalism to take care of all your problems. What is the "Stack Effect" - The stack effect is a principle of building science that basically explains how air flow is transferred throughout a home. Basically what is happening in your home is your conditioned air is rising from floor to floor until it leaves your home (exfiltration) and then replaced by new (infiltration) bad air through lower portions of your home. With this terminology in mind, it's almost common sense to understand how the stack effect contributes to poor home energy efficiency. Interior conditioned air (that you pay for) is rising into your attic space and leaking out of your house and being replaced by unconditioned air from your basement and crawl space. With a leaky home, your HVAC systems may have to work twice as hard, increasing your utility bills and making for a less comfortable home. This episode of Tom & Larry's Excellent Home Energy Savings Show shows and explains how Air Sealing increases your home's energy efficiency. This video is an informational short that explains why your home should be air sealed to prevent air loss. An obvious sign of air leakage in your home is insulation with a dirt-stained surface. Stains such as these indicate that the insulation is acting as a filter to the air that is passing through it. Accidental leaks - Air leaks are built into your home during the construction process by contractors and subcontractors. Once your home shell is finished (studs, drywall, beams, etc.) specialty contractors cut into it. Plumbers and electricians sometimes over-cut into your walls so their pipes and electrical wiring can be easily run throughout the home. Small gaps and leaks form over time; wood may shrink or warp and various other materials have different expansion and contraction rates. Age may get to your structure causing the integrity to fail over time at the joints. If these leaks aren't fixed - you are wasting money! Leaky homes with gaps, leaks, and holes can quickly add up to the equivalency of space an open window takes up. Gaps can be as small as a hole in your electrical light switch outlet or as large as what an HVAC contractor would install after they install ducts. Many air leaks are formed during the construction process of your home; many of which go unnoticed. However, these air leaks are our primary concern, because this is where your conditioned air escapes. If you insulate your walls and other portions of your home without air sealing first, you are creating a larger problem. In fact, the newly installed insulation will cover up and hide all the energy sucking air leaks affecting your home. Installing insulation before air sealing, can raise your utility bills and will lead to larger repair costs down the road - replacing and removing current insulation. Give your heating and cooling systems a break. Air seal your home so your heating and cooling systems don't have to use as much energy to keep you comfortable. Air sealing is an affordable and permanent energy saving solution. Contact us today to have your home's energy system evaluated and air sealed properly. Our contractors can locate and repair all your leaks, gaps, and holes draining energy out of your energy system. You can count on us, with just one call, we will have your home's energy system operating more efficiently and more comfortable so you can relax and enjoy your home. Air leaks are not easy to locate with the naked eye, that's why Ohio homeowners call us. Air leaks behind insulation are very hard to find; we utilize professional state-of-the-art equipment and annually train in the field of insulation to remain on top. Leaks be gone! - Here at Dr. Energy Saver, we recommend utilizing a two-part foam when air sealing leaks in homes. The foam solution keeps the nozzle in liquid form, expanding rapidly upon release to accurately fill all leaks and gaps. The two-part foam creates an airtight permanent bond that puts less stress on your whole energy system. Our company wants you to know that we're here to help. Once all the air sealing work is complete, our energy contractors can perform a second blower door test, to show you how much improved your air-tightness is within your upgraded home. We proudly serve Ohio neighborhoods including: Akron, Cleveland, Canton, Elyria, Lorain, Medina, Massillon, Lakewood, Chagrin Falls, Strongsville, Hudson, Cuyahoga Falls, Ravenna, Bedford, North Royalton, Westlake, North Olmsted, Wooster, Painesville, Alliance, Kent, North Canton, Beachwood, Barberton, Willoughby, Gates Mills, Stow, Brunswick. Contact us today by phone, 1-888-370-6924 or visit us online to schedule a free air sealing service estimate or for free home energy assessment.